Still life is one of the disciplines in drawing and painting. Although it is becoming increasingly less popular as time goes on it is till one of the major traditions undertaken by the artist, and one taught readily in schools and colleges. The aim of the still life drawing is to capture the different textures, tones and light effects that radiate from differing still objects. By selecting a wide range of objects, it is hoped that these objects will contrast with each other, producing sharp discrepancies between, say, the smoothness of glass and the roughness of lemon peel. Depicting such contrasts calls all of the artists skills into play, and depends, to begin with on choosing the right objects and arranging them correctly. There are many ways that you may wish to choose objects for a still life. Some artists arrange their still life to depict and allegory: That is to say, they pick elements that express certain meanings; an animal skull to represent death; a bowl of coins to suggest wealth and exuberance. Taken together these two elements warn of the fallacy of worshipping wealth – put simply, you ‘can’t take it all with you’. Alternatively, you may wish to paint or draw an autobiographical still life, focusing on a drawing of a collection of objects that either belong to you, or reflect some interests you have. This arrangement could incorporate clothes, musical instruments, objects from nature, and so on. However you choose to pick your items it is worth taking some time to pick those that will be represented well in a finished picture, and ones that will sit well together. Popular subjects of still life include fruit, vegetables, dead fish, dead game (one benefit here is that you can eat them afterwards! ), lobster, steel kettles, silverware, furs, jewels, wine bottles, and so on. Still Life set ups tend to be arranged around a central focus point, such as a large vase, a pheasant, a bowl of fruit, with other objects arranged around it. The key is to arrange the space in such a way as to fit well within the rectangular format that you then wish to draw or paint upon. Ideally, in this case, if you were to divide your paper lengthways and width ways down the middle, you would aim to have equal amounts of activity in each of the 4 sections of your page or canvas. Once you have selected and arranged your still life the selection of an angle from which to draw it from will help you to better compose the deal picture. It is a good idea to start out with a few sketches, to try and accurately portray the varying tones and textures as well as possible. From here it is possible to begin to abstract forms in order to compose a picture of your choosing, that better expresses you relationship with the objects. For example, if you are painting a vase, and wish to portray both sides of the vase, simply draw them side by side, or overlapping. 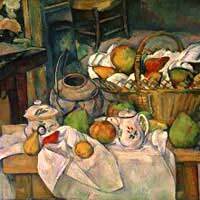 Cézanne (1839-1906) and Picasso (1881-1973) were masters of this style, effortlessly reinventing scenes to portray the elements they most wanted to show to us. Engaging with still life is an excellent way both to hone your descriptive mark making skills, and to better understand the principles of composition (as you create your own ‘scene’) and of abstraction (as you later diverge from it).